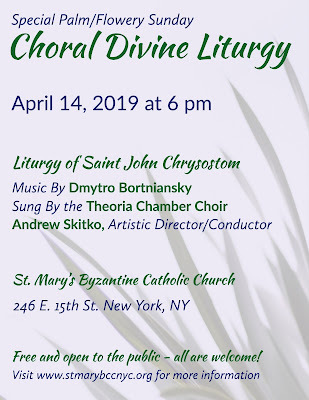 St Mary’s Byzantine Catholic Church in New York City will have a celebration of the Divine Liturgy of St John Chrysostom, with music by one of the greatest Slavic composers of music for the Byzantine Rite, Dmitry Bortanianky, on Palm Sunday, April 14, at 6:00 p.m. Palms and pussywillows will be blessed and distributed to the faithful. (Pussywillows are commonly used in place of palms in northern Europe, in both the Byzantine and Latin Rites.) 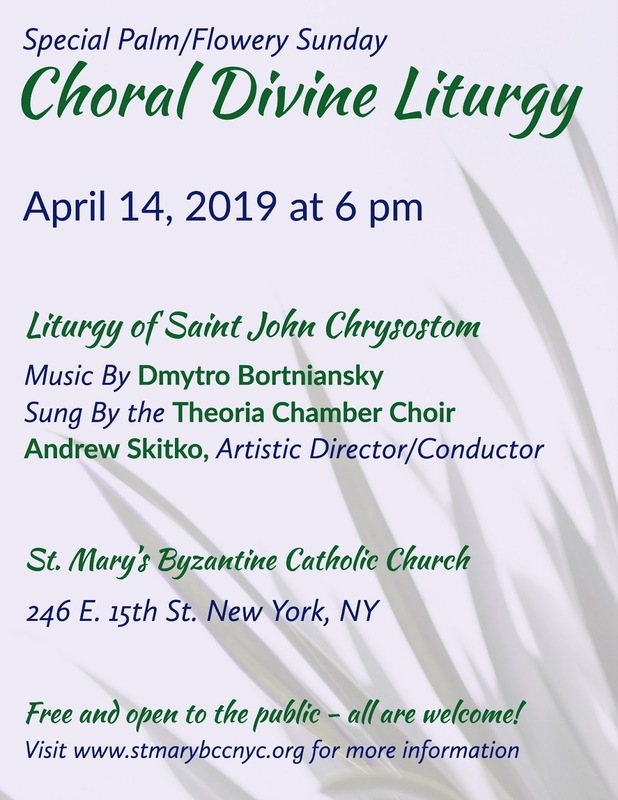 The Liturgy will be sung in English and Church Slavonic; the church is located at 246 East 15th Street, and the event is free and is open to the public. This is the third in an ongoing series of liturgies at St Mary’s that seek to present classical Slavic Church music in the context for which it was written, as the music of the Divine Liturgy, giving the congregation the opportunity to be immersed in the experience as part of their worship. Dmitry Bortniansky (1751-1825) became a member of the court choir in St Petersburg in 1758; in 1764, he performed a solo part in H. Raupach’s opera Alceste. While studying in Italy, he composed several operas to Italian librettos, and also wrote liturgical works to Latin and German texts, including an Ave Maria for two voices and orchestra. On returning to St Petersburg, he became a court composer, teacher, and conductor. In 1796, he was made the director of the court choir, then composed mostly of Ukrainians like himself, which he raised to a new level of excellence; he was the first native of the Russian Empire to hold the position, which had previously been occupied by Italians. During this period, he composed over 100 choral religious works, including 35 concertos for four-part mixed choir, 10 concertos for double choruses, 14 panegyric hymns, and a number of liturgical works for three and four voices and double choruses. The first edition of his oeuvre, 10 volumes of his sacred choral compositions edited by Tchaikovsky, was published in Moscow in 1882. In his choral liturgical works, Bortniansky combined the age-old traditions of Ukrainian choral music with the achievements of late 18th-century European music; the influence of Ukrainian folk-song melodies is clearly discernible in these works. Concentrating exclusively on the purely vocal a cappella style, he achieved a high level of technical proficiency in his sacred music, simultaneously imbuing it with a deep spiritual mood. The backdrop for the choral event is sure to just as inspiring. St Mary’s Byzantine Catholic Church is one of the most unusual religious buildings in Manhattan and provides a beautiful venue for the program of Slavic Liturgical Music. For more information call 212-677-0516, or visit https://www.stmarybccnyc.org/.